The new year has been a mixed bag of the good, the bad, the ugly, and then, some more good for us at Sesor. On January 2, Nigerians woke up to the news of militant herdsmen attacks in Benue that left 73 people dead and over 60,000 displaced. There have been 2 more attacks since then and Sesor has been in Benue to assess the situation. More on this in the next few days; we will be needing your support more than ever before. Thank you in advance! And now, the good news! 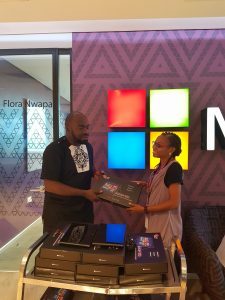 Just before the holidays, Microsoft Corporation donated hardware (notebooks, tablets and an android phone) worth $4,400 to support our work and Sesor received the donations on Friday December 15, 2017 in Microsoft’s Lagos office.